Over the next 18 months, I’ll be criss-crossing the 8th district from Rochester, to Brighton to East Lansing, listening to people’s concerns – and I’ll be bringing you into the process along the way. Because the fight to preserve the American Dream in the 8th district is a fight that everyone should want to win. I’m a third-generation Michigander and spent my early life on a farm in Holly, Michigan where I currently live and run a small consulting business. My family story is one of hard work and sacrifice, starting with my great-grandfather. He arrived on Ellis Island and achieved the American Dream by founding the family meat business, Hygrade Foods, which established its Detroit headquarters in 1949. Hygrade created a number of food staples beloved by Michiganders, including the famous Ballpark Frank, first sold at Tiger Stadium. The values of hard work, decency, and integrity that underpinned his success were passed down from generation to generation in my family, ultimately guiding me into a life of service. After college at Cornell University and a few years working for non-profit organizations, I went to graduate school at Columbia University in New York City. The 9/11 attacks happened during my first week in the city. That terrible day changed the trajectory of my life. I decided that after graduate school, I would join the intelligence community and to work to prevent future terrorist attacks against the United States. I was recruited to join the Central Intelligence Agency as a Middle East analyst, and within a year of joining the agency, I was deployed to Baghdad to serve alongside America’s soldiers and diplomats, doing my part to help in very complicated war. I served a total of three tours in Iraq over a span of five years. My tours in a combat zone led to various defense and intelligence roles at the White House, the Office of the Director of National Intelligence, and the State Department. I worked for President Bush as a member of his national security staff and was asked to stay on when President Obama took office. 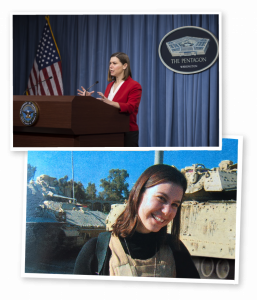 I took on a series of leadership roles at the Defense Department, and until January 2017, I oversaw policy at the Pentagon on Russia, Europe, the Middle East and Africa as Acting Assistant Secretary of Defense. There, I negotiated some of the Pentagon’s most sensitive national security matters from the fight against ISIS to the U.S. response to Russian aggression. But no matter how difficult the issue, it was the values I learned growing up in Michigan – a straightforward, commonsense approach – that helped me succeed as a national security leader. I’m fortunate to share these values with my husband Dave, who retired as a Colonel after 30 years in the U.S. Army. Dave served as an Apache helicopter pilot in the First Gulf War, Korea, and Kosovo, and he served two tours during Operation Iraqi Freedom, where we met in Baghdad. In Dave, I gained not only a partner, but also two amazing daughters who have started their own lives of service, one as an Army officer and the other as a physician. Throughout my career, I’ve been proud to work for both Republican and Democratic leaders who put the good of our country over politics. I plan to do the same in Michigan’s 8th District by ruthlessly putting the community’s needs over partisanship. 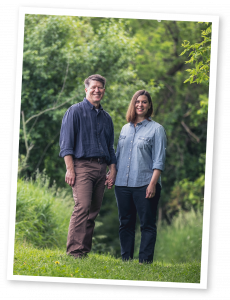 As your representative, I’ll rely on my family values, a deep sense of service, and professional experience to deliver results. But in order to do this, I’ll need your input and support. I look forward to engaging you at every turn. Our district deserves strong and principled leadership – and nothing less.